On The 4th of April, the Great Hall at London’s Guildhall was transformed into a military mess room. Long tables and benches almost the length of the Hall came alive with the buzz of conversation and the waft of delicious curry. What started in a marquee In Guildhall yard because the Guildhall kitchens were out of action at the time in 2008, has grown into a large annual event Which has contributed over £1.9 Million to 3 national service charities. 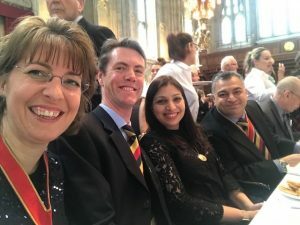 In its 11th year, the Lord mayor’s big curry lunch supports all members of the armed forces who have served in Iraq and Afghanistan and their families through the British army’s national charity, ABF the soldiers’ charity and in Association with the Royal Navy and Royal Marines charity and the Royal Air Force Benevolent Fund. 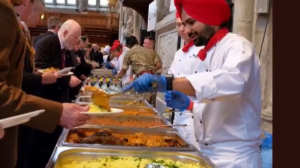 In addition, this year the Lord Mayor’s Big Curry Lunch linked with the Civic and Mayoral theme of employment and employability to provide financial support for veterans to take part in a programme designed to help them manage their pain and subsequently find meaningful work. Master Fueller had invited the Heads of the various committees and the Charitable Trust to break naan together and enjoy a glass of the Pol Roger sponsored champagne. 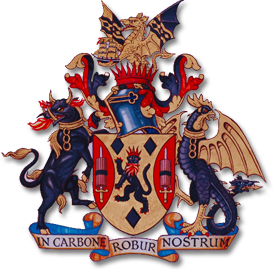 Having been aptly received into the Livery Hall, the party had time to peruse various livery sponsors of the event and of course the technological marvel that was the silent auction in the capable hands of the various military affiliates who are there. With all sorts of lots to bid on from the trip to South Africa to dinner at the light cavalry HAC mess night, there was much studying of lots and opening bids. There was also a prize draw on offer which attracted many entries for all sorts of delights from fine dining to the Royal Navy and Royal Marines Charity Celebration Cake. Then on into the Crypt for a small drinks reception and catch up while we waited for our call to lunch. Some lucky Fuellers were at the earlier seating so got a head start when the number was called. Meanwhile, out of view of the crypt, Prince Harry arrived to visit the event. He was presented with some baby items from the Worshipful Company of Framework Knitters where he stopped and chatted for a while. After visiting the dining Hall and being escorted around the event, he was presented with a box of flowers from a wonderful little girl who was with the Worshipful company of gardeners. The Prince took some time to speak to her before his departure. Soon it was time for the rest of our party to go to the Great Hall where we were met with quite a sight. Imagine if you will Hogwarts dining Hall on the first meal back after summer break, admittedly was slightly less candles, more Chelsea Pensioners than Professor McGonagall, but with just as much excitement and plate clattering! Various army personnel to helped guide diners around the room while more service men and women dished up wonderfully coloured dishes from huge trays followed by further personnel manning the bar! In the casual ‘find a seat where you can’ style of dining, new friendships were struck chatting with fellow diners with not a little bit of acrobatics thrown in trying to get on and off one’s bench! Unlike at home where you may get told off for having an iPad at the dinner table, it was definitely encouraged here as you picked up the tablet to place your bid on the silent auction. Screens around the Hall could barely contain their excitement as they silently declared each knew high bid with a flourish and although we did have one accidental bid which added a zero to the intended building amount, the process ran very smoothly. In fact it has to be said that when help was sought for said accident, it was resolved very quickly and professionally so no eating lunch in the dog house for said Fueller! Likewise, the David Marsh who was on a high bid for one particular lot turned out not to be the Junior Warden Consort after all but another guest with the same name. A large sigh of relief all round! All too soon our sitting was over, and it was time to move on through to the South Ambulatory where some Livery companies and charities had displays both selling their wares and advertising their cause. We were immediately approached by the little girl from the Gardeners Company who presented a huge pink plant to our Junior Warden who negotiated a slightly smaller order which would be more train travel friendly! The child was an excellent sales tool. At possibly not quite school age, she was not going to take no for an answer. Well done to her! The Framework Knitters had a riotous rainbow of socks and other items for sale. There were many other Livery companies enjoying the market trading, notably including the Worshipful Company of Fruiterers who were purveying the most amazing fruit baskets. 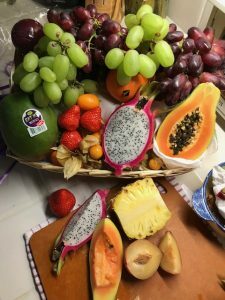 Papayas, dragon fruit, kumquats, kiwi, pineapple and mangos to name a few including huge juicy strawberries all wonderfully fresh. Amongst the various stalls we also passed military charities, pausing to learn more about their work, until we found ourselves outside the Old Library which was holding an author’s book signing, with contributions from the sale of each book going to the Lord mayors big curry lunch. Before long the silent auction came to a close which signalled the end of the afternoon. Alas, the Junior Warden did not win the prize cake, but several Fuellers were ready to head home loaded down with fresh fruit and snazzy new socks! While awaiting the final total raised on the day, it has been confirmed to have definitely smashed the cumulative £2,000,000 mark! That is a wonderful combined effort from all involved whether sleeves rolled up working hard on the day or those enjoying the atmosphere and some great grub! You might want to put the date for the 2020 lunch in your diary now, provisionally Thursday the 2nd of April 2020. You can find out more at www.soldierscharity.org/lordmayors. I can guarantee you won’t have been to anything quite like it before.